2-7 single draw is an older card game that was played in the Wild West. The game is only available at PokerStars but has made somewhat of a comeback in recent years. It was one of the few games played when the WSOP was just in its beginning years. 2-7 single draw is a challenging game for most people because the objective is to acquire the lowest hand instead of the highest. Luck and bluffing play a much larger part in 2-7 single draw when compared to other poker games. 2-7 single draw is closely related to 2-7 triple draw and 5 card draw. Don’t worry though, this 2-7 single draw guide will help beginning players learn the rules and order of the turns. The player to the left of the dealer button is the small blind and directly to his left is the big blind. The two blinds are compulsory bets and these should be made before all players have been dealt their 5 cards. The game proceeds in a clockwise direction and the dealer button changes position in the same direction (clockwise direction). Here is an example of how the blinds work in the game. Suppose you are playing at a $1/$2 table. Therefore, the small blind is a half the amount of the early bet (i.e. small blind = $0.5) and the big blind is the full amount of the early bet (i.e. big blind = $1). Once the blinds have been placed, all players will get to receive their cards and the betting round begins. The player left to the big blind player begins the initial betting interval. The player has three options at which s/he can either make a Call, Raise or Fold. After all players have made their betting options the first betting round will end. If there was no player who made a raise during the first betting round the player who made the big blind will have the option to ‘check’ without making use of any money and the next betting round begins. The next betting round is known as the draw. The player who had made the small blind starts the draw. The player will have an option to draw one or all his or her five cards or s/he can draw out none and this is known as ‘Stand Pat’. After the player has made the draw each player will them proceed to make theirs and it flows in a clockwise direction. 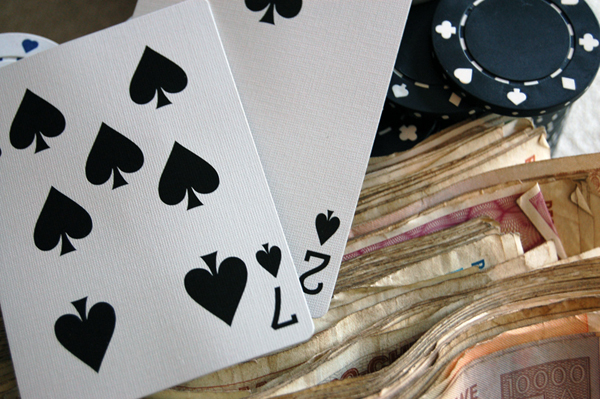 When all players have drawn their cards the next betting round begins. Please note: When a player draws a card s/he will be given a new card. Your hand will always remain with five cards. The small blind player commences the final betting round. The player will be able to check or bet their hand. The betting will proceed in a clockwise direction. Players will have an option to make a raise, a call or to fold. The round will end when all players have called the highest bet or either folded. After the final betting round players will show their cards and the pot is awarded to the player with the best hand. Don’t forget that the best hand in 2-7 Single Draw is technically the “worst poker hand” though. The lowest hand will be the winner of the pot. [caption id="" align="alignleft" width="170" caption="Carbon Poker is the only choice for players from the USA"] [/caption] Unfortunately for US citizens like myself, there are not a lot of options to play 2-7 Single Draw online. After PokerStars stopped accepting US players; the only poker network that has games running is the Merge Poker network. My recommendation on the Merge network is definitely Carbon Poker because they are one of the longest running and most reliable on the network. You can support PokerTrikz and earn yourself a $600 deposit bonus by signing up at Carbon Poker today. Even though it is uncommon for a 2-7 Single Draw game to start; you can find a few tables of 2-7 Triple Draw games or its variant, A-5 Triple Draw. All of the 2-7 draw games are very similar, but you can read the 2-7 Triple Draw rules if you want to check up on anything. This article was submitted by my friend Josh. I have done some quick edits, but the main content is his.